Carmex lip balm Review| Best lip balm ever |Multitasking lip balm. Well you already know my feelings about today’s product from the title above!!! Yes, this is officially the best lip balm I have ever used in my life! Okay, so let’s get on with the details! Carmex lip balms come in a variety of different forms(tube, stick, tub) and flavors(strawberry, cherry,…). 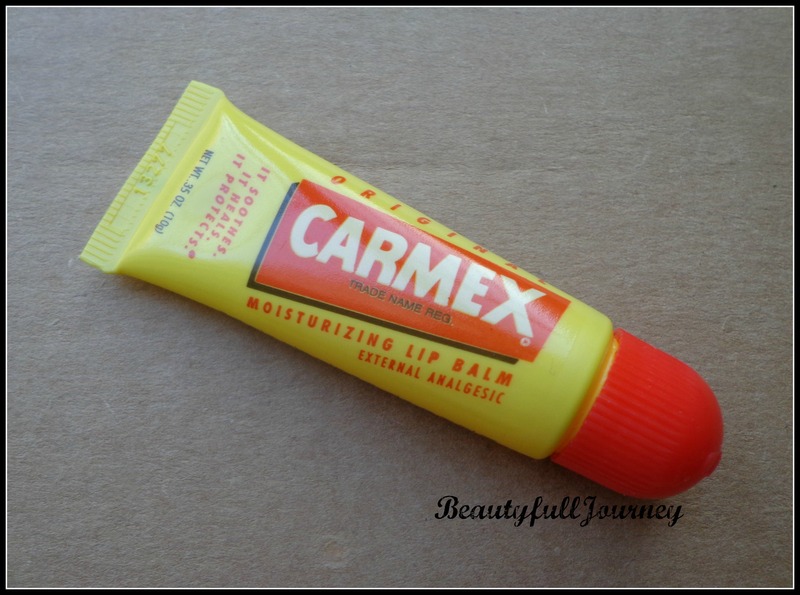 What I’m reviewing today is the most basic form of Carmex that is the original moisturizing lip balm in tube form. I had heard about this being a much loved lip balm in US but didn’t get to try it, and then I got it as a freebie somewhere! And that changed my life! Oh yes it did! I got this in the month of February and in Chicago, there was soooo much snow even till march so you can imagine the extreme weather in February. With all the -20C degree temperatures, extremely harsh winds plus the heating inside, it all made my skin and lips extremely dry and flaky! So much that my lips literally felt like they have been torn! My lips were very very chapped when I used this lip balm for the first time! I used it at night before sleeping and I was so surprised to see my lips almost 90% healed and so soft! It is seriously very moisturizing and makes my lips so soft! In winters when my lips were very chapped, I used it more often but I don’t use it daily as it feels very strong. I feel this is one of those rare lip balms that actually heal lips completely and make them super soft instantly!! The one I have comes in a simple, no-fuss tube. Its easy to squeeze out the balm and apply. It is also pretty hygienic compared to lip balms in pots/tubs. It is a clear lip balm, like Vaseline. Its texture is similar to Vaseline or any petroleum jelly but slightly less heavy. It’s a little on the liquid-y side as compared to standard Vaseline but that may be because this is in a tube and need to be a little runny to come out easily. On lips, it looks just like Vaseline does, slightly glossy. But unlike Vaseline, this doesn’t sit on lips and makes you feel like you have something heavy on your lips. The lip balm stays on my lips the whole night, and when I apply during the day, I don’t feel like re applying this for a really long time after one use as it keeps my lips moisturized for almost one full day. This also comes in flavors like strawberry, cherry… I will try another variant once I finish this but I feel I always want to have this original flavor with me! So, I’m definitely repurchasing this one! Overall, this is an awesome product. 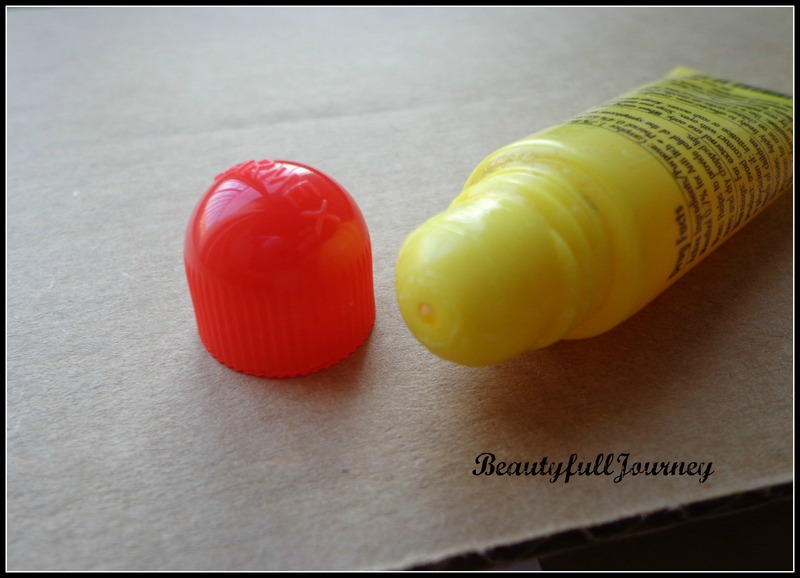 And if you have even slightly chapped lips, its a complete must have in my opinion. Definitely try and get it from someone abroad. I wish it starts selling in India too. The price further makes it a must have! It is possible that some people might not like it, but it is still worth trying once! < Previous The Body Shop Sorbet Refreshment from Top to Toe. Carmex peels and cracks on my lips. 😢 But nice review. It’s one of those things where people hate it and love it.